There is a number of really beautiful, high and accessible mounts in Zailisky Alatau ridge that can be climbed in any season, just in 1 day. 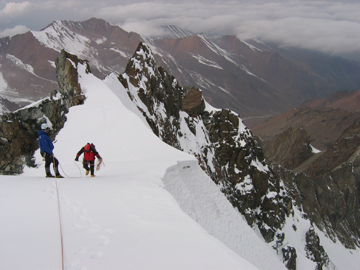 Have started from Almaty by 6am, you will be home the same evening full of fantastic impressions of your Alpine style ascent. If you are firm with your decision to make another climb, but do not know where and how to start, then the three following steps will help you to realize a dream. You need to set a date and time. 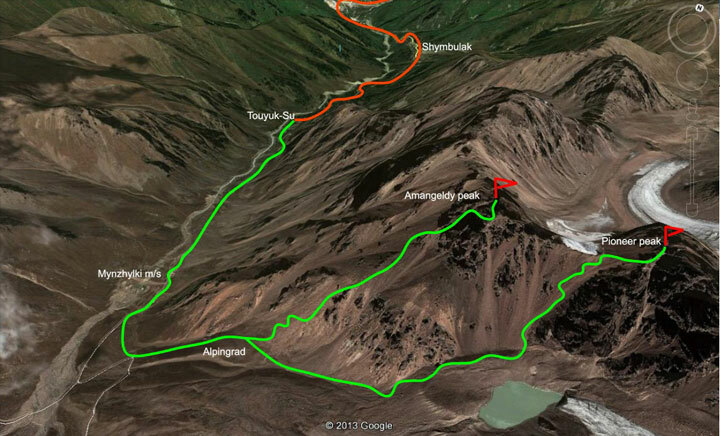 Climbing of Amangeldy (4000m) or Pioneer (4031m) peaks is possible in any season besides early spring (March and April). Summer mountaineering is much more pleasant, of course, but such a motion can be also nice in cold time of a year as well – you just need to dress accordingly and be ready to meet a wind and snow. 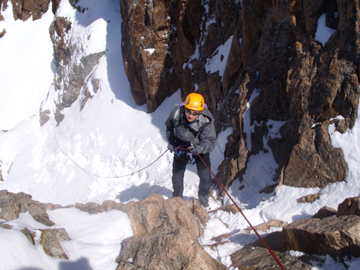 At our website you can also find description of different routs to the peaks of Zailisky Alatau ridge, in “Climbing” section. And there are some pictures that can give you an idea of the forthcoming climb available at our “Photo-gallery”. Step 2. Dress and get ready. 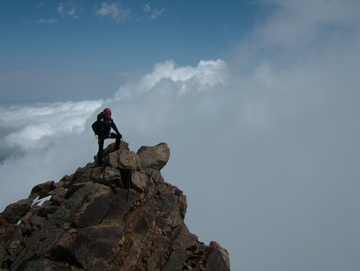 A list of necessary clothes you can find at our website, in «Climbing» section. If you have any questions regarding the equipment, size or staffing, you may call our guide on duty any time. A right mood can guarantee up to 50% of success. It is extremely important to be ready to the trials of hard walking, cold and some job in a strong wind. But all that will be inessential in comparison with a feeling of triumph and delight on the blazing snow covered top of the peak. 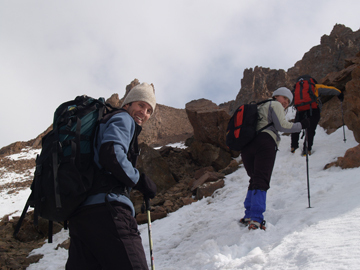 Further to our experience, it is not really important how trained you are, as an absence of strength is usually compensated by the guide’s proficiency and a right walking rate. If you have a zero background, then we can recommend you to take 1-day climbing course that will allow you participate consciously in a process, to use all the gear, and will help guide to provide your safety as well. So, the date is set, mood is good and you are dressed accordingly. 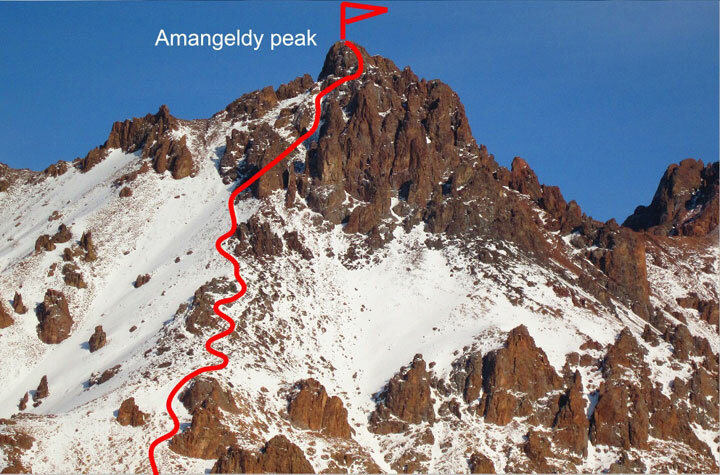 You have chosen Amangeldy peak as your aim this time. 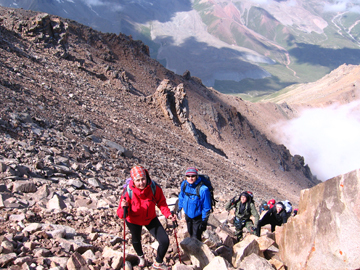 Usually, 1-day climb starts by 5-6am, when you start driving from the city in a direction of Touyuk-Su canyon (Maloalmatinsky gorge, above Shymbulak ski resort). Pedestrian travelling starts here, at the end of asphalt road. First part of the trip follows a grounded trail up to Mynzhylki meteo-station at a height of 3000m above sea level. This part takes 1.5 hours. Keep walking up by rather steep path to the glade “Alpingrad” (3450m asl). Climb from Mynzhylki to Alpingrad takes 45-55 minutes. 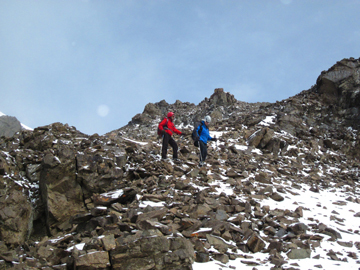 After a short break, continue mount a rocky talus (covered by snow in winter) of the southern slope of Amangeldy peak. 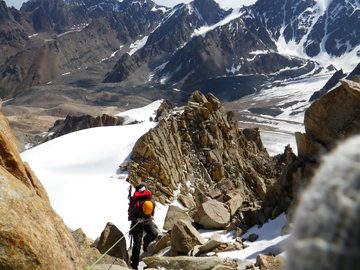 A 2-hours climb by the slopes and then clefts ends at the foot of a rocky “head” of the top. Here a technical part of the route starts, and we need to put on a special equipment (helmets, body harnesses with carabineers, ascenders etc.). There are 120m of climbing by the rocks (not too hard), and all this part is handled by the guide with ropes, stations etc. Summit! From the top of Amangeldy peak all the city is seen, up to Kapchagai. 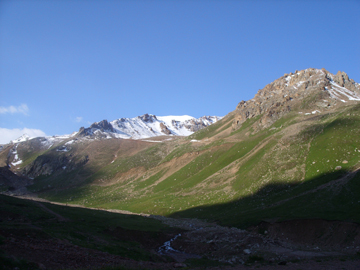 And beautiful panoramas of the snow and ice covered mounts, glaciers and moraine lakes surround you. Way back from the top follows the climbing route. 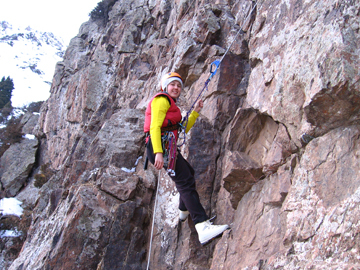 A rocky part will be done by fixed ropes and special rappelling devices (figure eight). After that, having all the gear packed in a rucksack, continue walk down by the same path. A way back from the top to the car takes 2-3 hours. 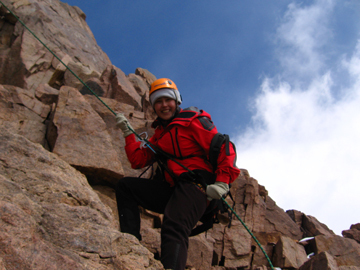 Depending on the weather, member’s experience and quantity of persons in the group, a whole climb can take from 8 to 12 hours. - all necessary special safety and climbing equipment: helmets, body harnesses with carabineers, runners, ascenders and descending devices. 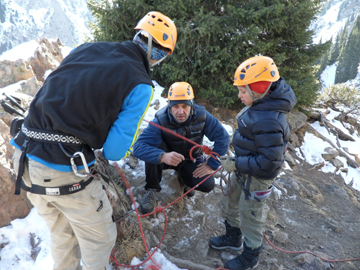 A guide will also have the ropes, special climbing tools and carabineers needed for handling of the route. In a guide’s set we also include a first aid kit and communication means (radio, phones etc. to connect with rescue team). 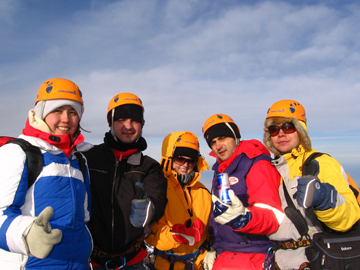 We usually work with small groups of mountaineers, that means an individual service for you and couple of your friends (groups of 1-5 persons). 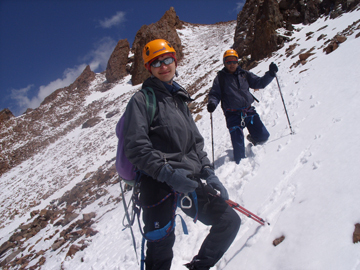 But, we have an experience of mass climbing organization as well – in this case we will pre-arrange a route to keep maximum safety for all group members.